Last fall we asked for your scariest Studio 49 instruments, and boy did you frighten us! We saw ghoulish glockenspiels, creepy chromatics, and mysterious metallophones. You unearthed many hair-raising relics from your instrument graveyards. 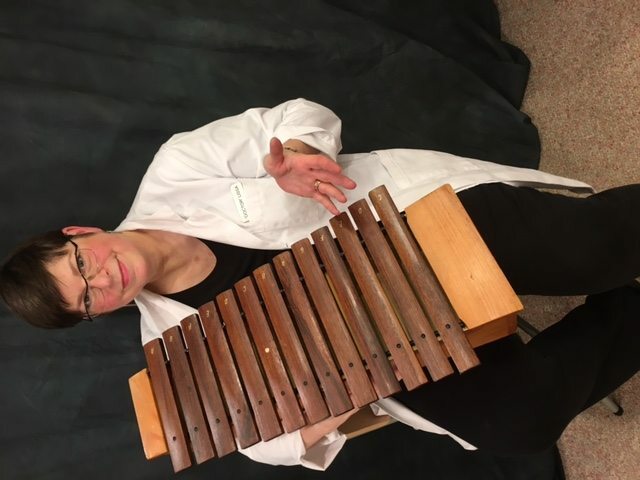 But it was this vintage xylophone from Ridge Ranch Elementary School in Paramus, NJ that really made us shriek! 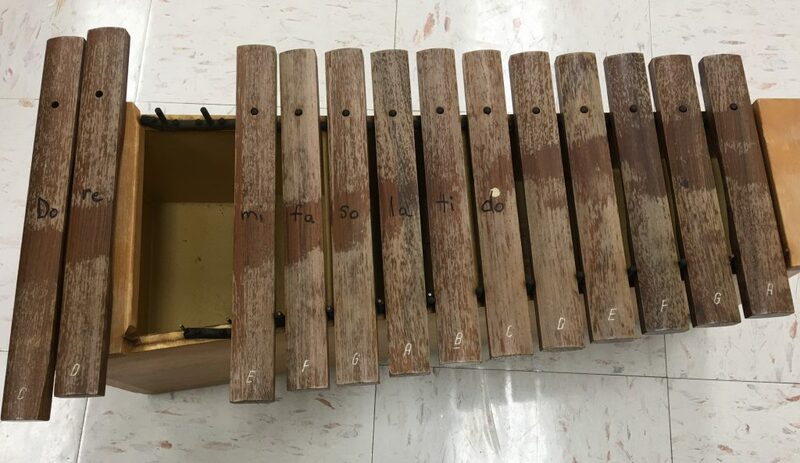 After years of neglect and exposure to the elements, this xylophone’s bars were seemingly damaged beyond repair. But Teaching With Orff’s own “Doctor Lissa” was ready at her Instrument Repair Hospital to resuscitate this critical patient. Below she shares her renovation process in the hopes that you can revitalize some of your own relics and return them to beautiful classroom condition! 2. Straighten bent pins gently with a pair of pliers. 3. Vacuum out the inside of the resonator box. 4. Clean the inside of the box with mild soap and water. 5. 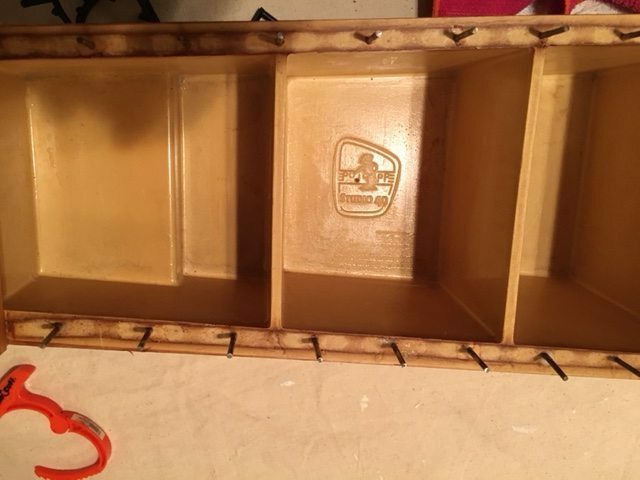 Polish the outside of the resonator box with Scott’s Liquid Gold furniture polish. It cleans the wood and minimizes any scratches. 6. Replace the old rubber tubing with new. Gently slide it over the pins. 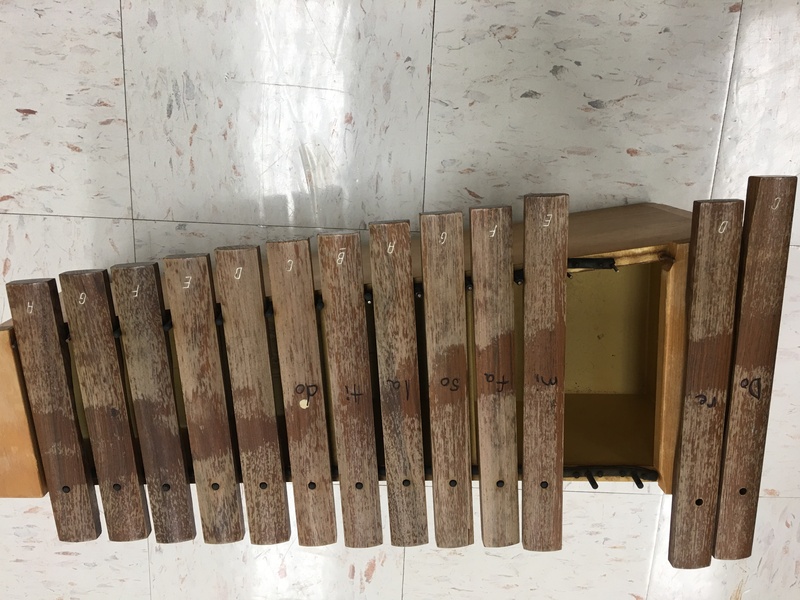 This poor instrument was kept in a closet that had a leak. Water damaged the finish on the bars. This was very unfortunate. 1. 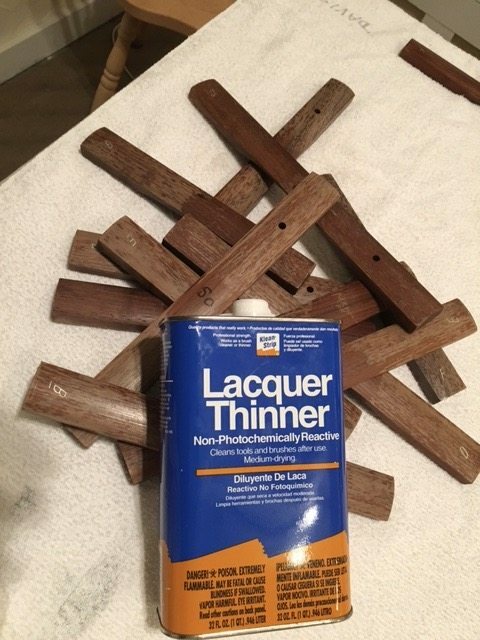 After consulting a furniture maker, a tiny bit of Lacquer Thinner was tested on the side of one bars. It seemed to remove the finish without raising the grain of the wood. Each bar was treated with Lacquer Thinner very sparingly and the damaged finish was removed. 2. Next Old English Scratch Cover for Light Wood was used to treat the bars. 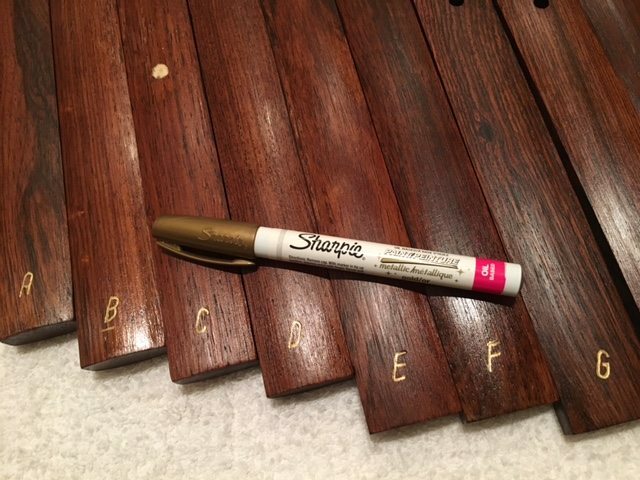 Normally, Old English Scratch Cover for Dark Wood can be used for these bars. But since the finish was removed it would have made the bars very, very dark. The lighter color helped to restore the bars. Next a coat of Tung Oil was applied. This helps to seal the wood. 3. Finally, use a fine tipped gold metallic Sharpie to redefine the letters. 4. TA DA! This instrument is no longer scary. It looks and sounds great. Make sure you store your instruments is a safe, dry, place out of the sunlight and dripping water. Lissa taught general music in a suburb of Cincinnati. 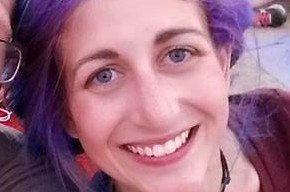 Lissa currently teaches Pre-K - 6 in at a Montessori school in Northern Kentucky. 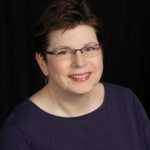 She is President of the Board of Directors of the Cincinnati Children's Choir and has served on the American Orff-Schulwerk National Board of Trustees. 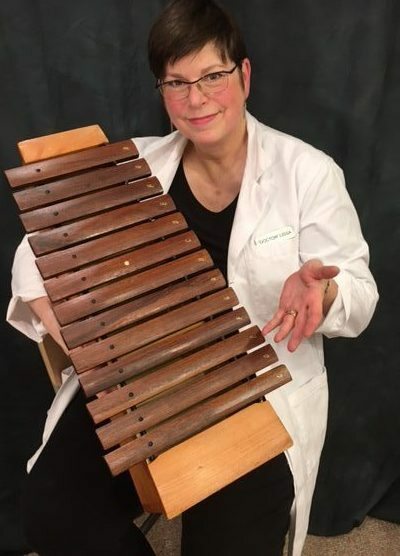 Lissa presents Orff-Schulwerk workshops and classes for teachers and children. Wow! 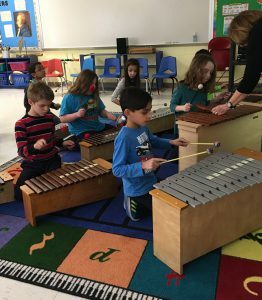 I am inspired to work on my instruments over the summer! I have some that I was sure were too far gone to repair. I’ll send in my photos after the makeover…and 20 lb weight loss of the technician!! Hi Kathy! 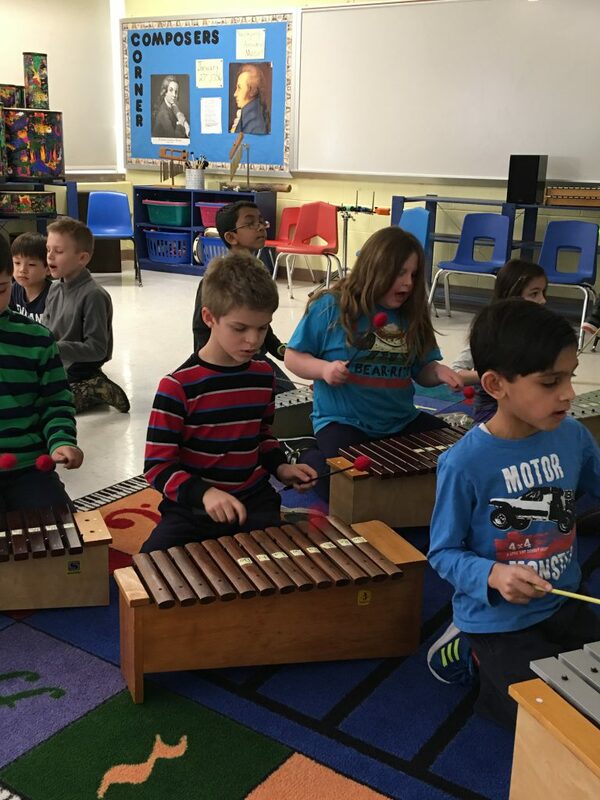 We are delighted that you are inspired to work on your own instruments! If you need help along the way, check out our Instrument Repair Hospital videos and feel free to contact us with any questions. And please share your before and after photos with us when you’re finished. We’d love to see them! 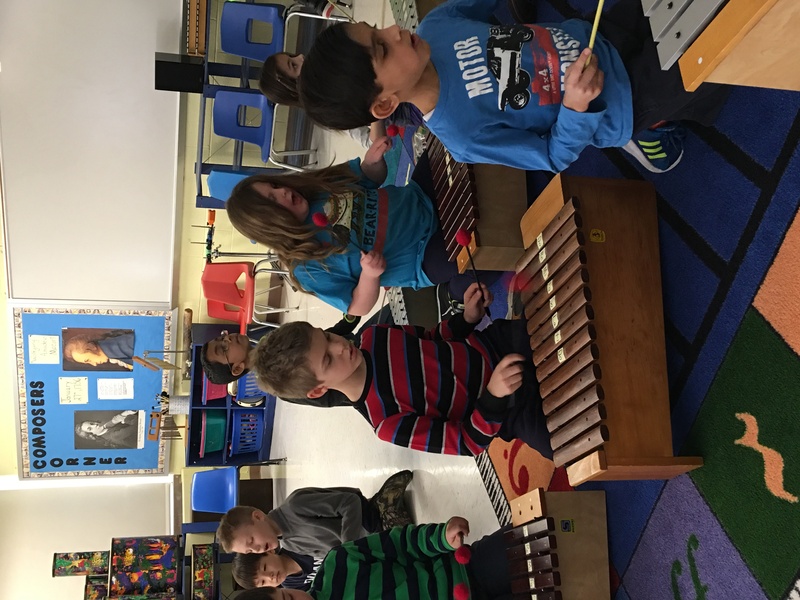 – Your friends at Teaching With Orff. I inherited a couple of glockenspiel that having pitted, weathered bars. I didn’t want to mess with them in case they would be irreparably damaged. They sound pretty good, and still ring. Can I do anything for the bars to make them pretty and shiny once more? Thanks! There is nothing you can do to make the glockenspiel bars shiny again. If they are rusty, you can remove the rust with Naval jelly, found at the hardware store. It’s used to remove rust from ships. If the bars are simply grungy and dirty you can clean them with bore oil, the type of oil used for cleaning guns. Although they might not be pretty, glock bars that have issues with the finish usually sound just fine. That is an awesome repair, Lissa! This is an example of why teachers should buy nice instruments, such as Studio 49. Since they can be repaired, they can last forever! Wow! This is amazing! What a beautiful gift to give a fellow teacher! I personally love the older instruments in my classroom. They have such a beautiful mellow sound to them but they are falling apart. I’m inspired to get them in tip top shape again! Where did you get the rubber tubing for the pins? What about the rubber that weaves between pegs? How about scratched metallophone bars? I have a bass metalophone that buzzes on certain bars and is dead sounding in places. What can do for that? I’ve replaced the tubing that is woven underneath the bars and some of the rubber tubing around the pins. But it seems that if I have all the pins covered with rubber, then it deadens the sound completely. 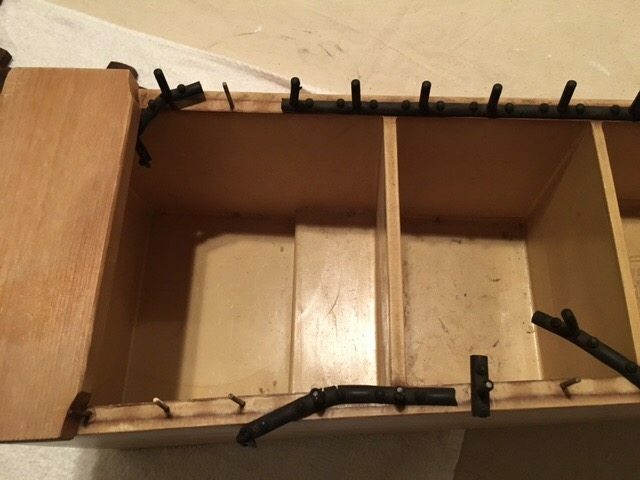 You can fix a buzzing box with clear silicone caulk and wood glue. You’ll need a caulking gun. Watch my repair video to see how its done. Most likely the glue has dried out in one of the seams or there is a crack in the wood. This is a pretty easy and miraculous fix. Several of my instruments have come loose from the wood on the top where they get picked up. The tiny nails that hold them in place simply can’t hold the instrument’s weight. Can I use a larger nail or do I use liquid nails or WHAT do you suggest. Every time the instruments get moved the parts come off. This can happen when the glue dries out. Since the instruments are often carried by those pieces on the ends a more secure way of fastening them back on is called for. Although it won’t look pretty, four wood screws carefully placed in addition to wood glue should do the trick. Make sure they line up with the resonator box. I love Lissa Ray’s instrument repair ideas. I have one suggestion to add on to her barred instrument plan. When straightening the pins first protect the box around the pin by clamping the box. I use a very inexpensive pair ($4-$5) of locking pliers that have swivel pads. You could also use a small clamp The goal is not to squeeze really tight. But to provide a firm support to the wood, so the leverage you are applying to the pin does not cause the box material to crack. The locking pliers make for a quick grip and are easy to put on and take off with one hand. I have the rubber plugs that keep getting pulled out. Any recommendations on the type of glue I could use to keep the plugs/pegs in the studio 49 xylophones? Wood glue should do the trick. You’ll still be able to remove them if you ever need to replace them. One drop of wood glue should do it. They will still be removable if you ever need to replace them due to damage. Thanks for asking and good luck. You students and instruments will love that you are taking care of them! Do you have any suggestions for replacing MEG nails and tubing. If you post a picture I might be better able to help you. If the MEG nails are the jagged ones there is a product electricians use that you can buy a PT a hardware store. It’s called heat shrink tubing. Toy can cut a small piece and then put it over the nail. Use a hairdryer or heat gun(be careful) to shrink it. It will mold to the shape of the nail. Use Studio 49 tubing for glocks or xylophones. That should work. Thanks for asking and good luck. I have had real success with repairing the rubber with screen spline that I purchase at local hardware store…under $5 will repair a few! Wast to do and IT WORKS!!!!!!!!!!!!!!!! !